SunBody Goes For The Gold! This is how I sun body! 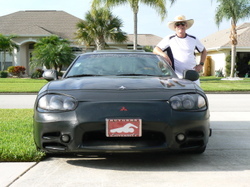 First of all, the car you see me standing next to is my 1999 (the last year made) Mitsubishi 3000GT VR-4. This car was in the first movie, The Fast and the Furious. It was supposed to be the staring 10-second car that Paul Walker was to drive, but in a major scene, he could not fit through the moon roof to jump out as the car was traveling fast next to a large truck being hijacked by a bad character, Vinnie. They replaced the VR-4 with a '95 red Toyota Supra but kept my black car for a few other scenes in the drag racing sequence. Anyway, I was preparing to drive to the pool where I coach swimming. I have had 4 Olympians in the past and have a young man now who stands a great chance of making The Olympic Team. In the next few days, t Olympic Trials, we will know. I have had several skin cancers over the years resulting from my being on deck in the blistering sun. The high-quality and large size of the Sun Body hats that I wear help to keep me protected, along with sun screen, of course. You can see two different models of a similar style, both of which have a 5" brim to protect my face, ears and neck. You can also see, if you look closely, the USA Olympic medallions that are available at the Olympic Training Center where I have also coached. I am proud to display this medallion and all it represents. Thank you, Sun Body, for having such functional apparel for someone in my profession. Coach Ed Nessel, R.Ph, MS, MPH, PharmD. The Wild West is thought to have been a dangerous place, and certainly would have been a lot more so without the help of local healers. In a region where university trained doctors were far and few between, it was mostly informally trained women who were the repositories of practical medical wisdom. They assisted with births and brought grace to the moment of dying, were called to administer elderflower and yarrow to feverish children, and tend plow cuts and bullet wounds, packing them with poultices made from plantain or usnea. Those with Native American blood or education were known as Medicine Women, while to the Hispanics of the Southwest they were called Curanderas. Their methods and cures were a reflection of local culture as well as local biota and an inspirited landscape, and every region featured its own pharmacopeia of indigenous plant species. From secret Basque cures to Apache remedies, local homemade medicines were usually more available and often more effective than expensive imported pharmaceuticals. In point of fact, the proliferation of so-called “Patent” medicines, often with harmful additives as well as wood alcohol, was one factor explaining why the overall health of men and women on the American frontier was actually better than that of folks living then in the large Eastern cities. 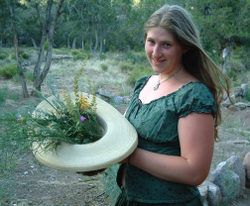 Kiva Rose embodies the Medicine Woman Tradition, drawing from the traditions of the past even as she finds ways to bring natural healing and herbal wildcrafting to the modern world. Living seven river crossings from the nearest road, her home serves as a wilderness teaching center for herbal students from all over the country, gals who join in plant-identification walks where they’re shown how to select, harvest and utilize powerful wild herbs like estafiate and oregano de la sierras. Known for dressing very nattily and with a taste of the Old West, there is no part of her wardrobe more treasured – or put to more uses – than her open crowned SunBody hat. She has used it to transport minnows to the river, saving them from the sad fate of an evaporating tributary, and filled it with seeds to tempt chipmunks into her lap. But more often, it protects Kiva’s fair complexion from a blazing New Mexico sun until she gets deep into her favorite patches of plants. She then flips it over as her students smile and watch, her SunBody magically becoming a finely woven plant basket, soon overflowing with her canyon home’s herbal bounty. You're going to love this. 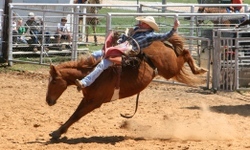 I have a small riding school in Georgia, the Red Boot Ranch. 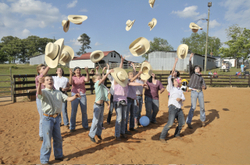 We had a Cowboy Challenge Event for the riders, and they all got Sunbody hats at the end of their ride. 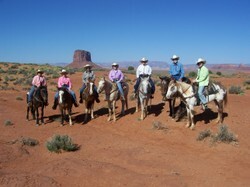 five of us had on Sunbodys and we all could have sold ours off our heads to folks we ran into on the trip from Las Vegas to the Grand Canyon to Monument Valley to Flagstaff and to Phoenix!! !